Shyrokyne was shelled from tanks and infantry fighting vehicles. Over the past day, the Russian-backed militants in Donbas 51 times fired at the positions of Ukrainian military in the zone of the antiterrorist operation in Donbass, including from the weapons prohibited under the Minsk agreements, the ATO press center reported 12 December on Facebook. Talakivka, Maryinka, Krasnohorivka, Novoselivka Druha, Chermalyk, Lebedynske and Vodyane were shelled from 122--mm artillery and mortars. Krasnohorivka was under the fire of an enemy sniper. In the area of Shyrokyne, the militants over 10 times fired mortars of various calibres, as well as infantry fighting vehicle and tank weaponry. 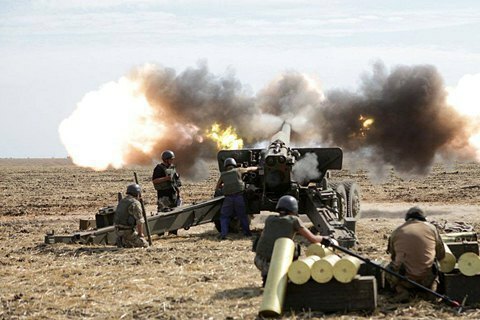 In the Lugansk sector, the terrorists fired of mortars of various calibres on Balka Kosharna, Popasna and Krymske. In the Donetsk sector, Troyitske, Opytne and Avdiyivka were shelled from 120-mm mortars, while in the area of Luhanske the enemy used grenade launchers, infantry fighting vehicles and heavy machine guns. In the previous day, three Ukrainian servicemen were killed in combat, and two others were wounded.